This week sees the release of the Perth filmed thriller Hounds of Love. Set in the 80s Hounds of Love is an examination of the twisted relationship between a predatory couple and their next potential victim. It is a psychologically tense game of cat and mouse, that can often be excruciating, yet phenomenally worthwhile viewing. 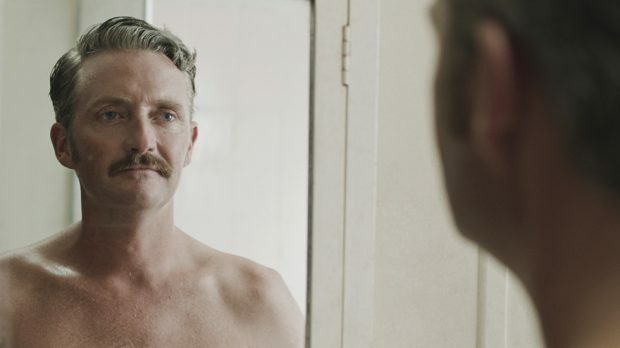 DAVID O’CONNELL spoke to one of the stars of Hounds, Stephen Curry, about playing a serial killer, the praise his performance has been receiving, and how it was a million miles away from his previous work in comedy. Hounds was initially inspired by director Ben Young reading about female serial killers and the influence of their male partners. Young conceived a script that explored those aspects of codependency, control and domestic abuse. For Curry the challenge became to embody that. Curry found two ways to portray this. The first was ignoring boundaries. “I think if you don’t’ possess empathy the boundaries go out the window, as the boundaries are only prescribed by what you want,” he says. The second was more complex. White is a character that might not be able to feel love, but he can fake it to get his way. That meant Curry had to ignore one of the fundamental pieces of advice he had received on acting. “From day dot I’ve had directors tell me to stop acting, so you can’t see the cogs moving,” says Curry. “This is a very strange situation where you’re playing someone who spends his entire life acting to get what he wants. You’re acting a character but remembering these lessons from a director when you were 13 years old. It’s very confusing. The result is essentially a three-hander, with each character vying for what they want and needing to manipulate another to get it. Although the stakes are life and death. Despite it’s brutal subject matter, Hounds of Love demonstrates a visual restraint. It often doesn’t show the depravity or violence, but instead looks at the emotional impact. It is intense and harrowing, but not gratuitously so. The result is a stand-out performance, albeit an often brutal and terrifying one. It left some American critics confused that Curry is considered a comedian, when it premiered at the Venice Film Festival. Even his mum was initially reluctant to see her son sink his teeth into the role of a depraved psychopath (although she did eventually enjoy seeing it at the Perth premier – Curry reports that they’re still cool). As for what an acclaimed dramatic role could mean for the actor’s future: “I think I’m done – might go into accounting or something,” jokes Curry.